Please make sure it's correct! 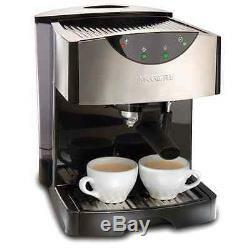 Coffee's Automatic Dual Shot Espresso and Cappuccino Machine creates authentic, bold espresso drinks when and how you want them. Water reservoir makes filling easy, the thermal block heating system heats water fast, and the 15-bar pump system brews rich, crème-topped espresso with impressive results. Choose a single or double shot porta-filter for serving size options. When a cappuccino or latte order is up, use the frother to quickly steam milk up to a creamy finish. Includes tamping tool and recipes. 15-bar pump system uses powerful pressure to extract a dark, rich espresso brew. Frothing arm makes creamy froth to top off your cappuccinos and lattes. Make 2 single shots at once with dual-shot brewing. Thermal block heating system provides barista-speed brewing and heating. Removable, washable drip tray keeps brew space neat and tidy. W:13.7 x L:11.5 x H:13.0 inches ; Weight: 8.9 pounds.